Notes: Based on the manga by Sakura Kenichi. There's one thing that kept me watching this show to the very end: plot twists. Just when I thought I had the show down flat they went in a direction I'd never considered before. Now, while Dragon Drive certainly isn't any Lain, it still managed to keep even this jaded viewer guessing from time to time. Not all the plot elements are spectacular though. Some extremely overused story devices sneak their way in (our characters have to fight evil versions of themselves while putting faith in their loyal dragon companions - gee whiz, how novel). But I suppose in trade off there is relatively little filler and hardly any recap at all. Perhaps what shines almost as much as the surprising turns in the story is the truly extensive cast. There are well over twenty important characters. From the future bishounen Tachibana to the gruff battle-hungry Rokakau, there's sure to be a character that you can identify with - or at least laugh at. Each character manages to be a clearly defined individual with their own ambitions and fears. As such, each character is able to add that much more to the story and in the end a pretty intricate plot is woven even though the story by itself is a rather simple one. While the characters don't make up the story entirely, they're equally as important. The animation shines in a more literal sense. The dragons seem every bit majestic and powerful. At the end of the series a few particularly beautiful dragons appear. The mix of CG effects with more traditional animation works very well in this setting and manages to feel natural. I really wanted to have a dragon of my own by the end of the show. The humans, and just about everything else, are pretty standard fare though. 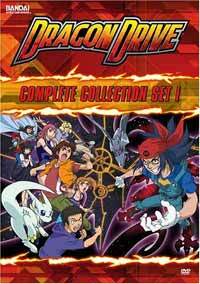 Overall, despite being easily confused with any generic monster-battle show at first and using the perhaps cliched themes of teamwork and unity, Dragon Drive manages to hold its own. It's an enjoyable ride that should leave you with a few laughs and a smile on your face - after you stop squealing over how cute Chibi is. Recommended Audience: It's good for just about anyone. There's some bloodless violence, but this was meant to be a show for younger audiences.